So it’s been a while. I think every single post I’ve made here in 2017 has started that way, but considering it’s been more than 3 months since the last post, it merits another mention. Sorry? It’s the political situation (making food posts seem frivolous), it’s a really rewarding but also time-consuming choir show (making me just feel tired), it’s a growth in creative works elsewhere (making me feel like I’m running the well dry/burning my candle at both ends/pick your metaphor). But here we are! With… kale? Yep, I’m apparently that hipster. In my defense, I was eating kale before it was cool. (I realize I’m not helping.) But at the farmer’s market last Saturday, there was this big, beautiful bunch of lacinato kale calling my name. If this is your first visit to the church of kale, you may not be familiar with all the different kales out there, so a quick primer on the kales you’ll see: there’s curly kale, which is, well, curly. I know some people like it, but I find it impossible to clean, not to mention scratchy and weird in my throat. Let us not speak of it. Then there’s a set of variety that I usually see labeled as red kale, Russian kale, or (natch) red Russian kale. It’s a broad flat leaf, multi-lobed, almost like a big gray-green oak leaf. I like it well enough, and as a baby leaf it’s nice in a salad, but it’s less common. My favorite, though — my love — is lacinato kale. It’s a big oval leaf, sort of like a collard, but pebbled like alligator leather. You’ll also see it called dinosaur kale, because people think it looks like reptile skin I suppose. Lacinato kale is easy to clean, easy to prep, has a nice rich flavor, and turns a beautiful emerald green when cooked. So anyway, fast forward to Tuesday night, when I get home from work and I’m just wiped out. It was hot, I was overheated, I needed to just sit on the couch and cool down. 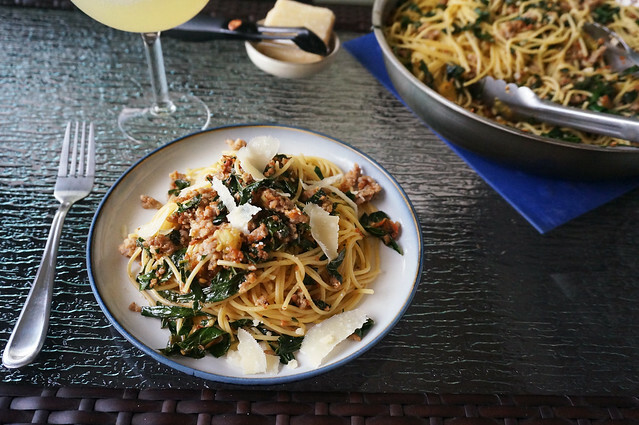 But all the way home, I’d been thinking about this kale: sliced into little ribbons, paired with little nubbins of crispy sausage, maybe… tangled around some spaghetti? Yes. Yes! This was accomplishable. And it was. In no more time than it takes to boil a pot of water and cook noodles, I had dinner. 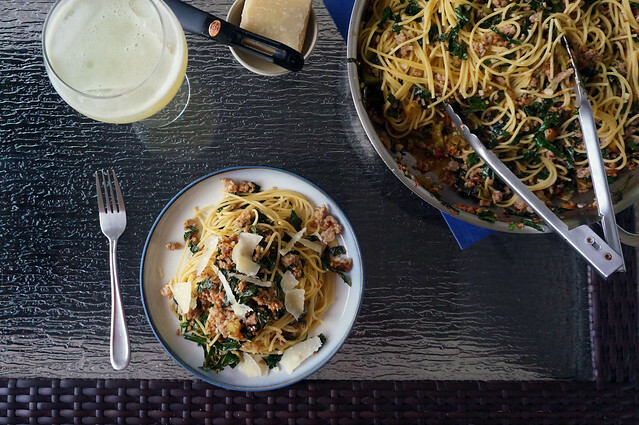 And not sad dinner, either, but a rich, filling dinner that still felt light enough to eat out on the summertime porch once the clouds rolled in a bit, almost a warm salad of pasta and greens. Not bad for an I’m-so-tired weekday dinner; I’ll definitely be making this again, and I hope you will too. Just a simple weeknight meal that makes the best of midsummer vegetation and pantry staples. 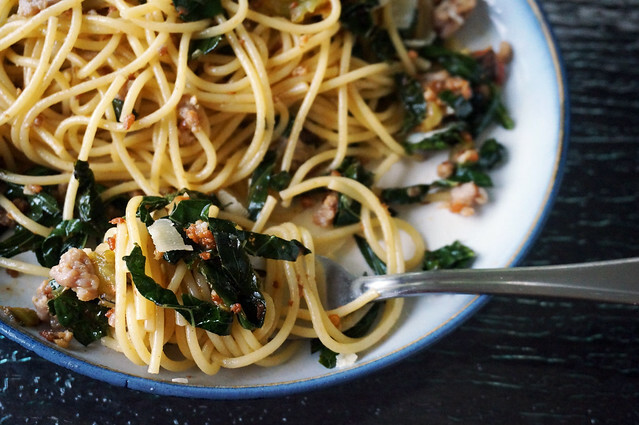 The kale and spaghetti make a lovely texture and color contrast, and the sausage gives it a simple richness (though see the options for a vegetarian idea). A little prep work: Bring a large pot of salted water to a boil over high heat. Prep the kale: remove the ribs and crosscut the leaves into thin ribbons. Begin preparing the sausage (below), but keep an eye on the pasta pot and add the spaghetti when it comes to the boil. In a wide skillet over medium-high heat, brown the sausage in the olive oil. Continue cooking, breaking the sausage up into small bits, for 8-10 minutes, until it has begun to crisp. (This will seem too long, and you may worry about the layer of brown stuck to the skillet, but this is desirable.) Add the garlic, crushed red pepper, and a good pinch of salt, and cook until fragrant, about 30 seconds. Add the wine and cook, scraping up all the browned bits, until the wine has entirely evaporated, then add the kale and tomatoes. 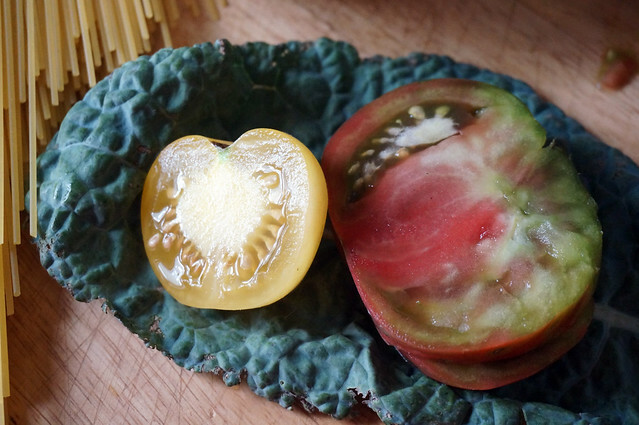 Continue cooking until the kale softens and the tomatoes begin to break down. (I like my kale a little toothier, but you can certainly cook until it softens more thoroughly.) Hold at low heat until the spaghetti is ready. When the spaghetti is al dente, drain it, reserving a bit of the pasta water. 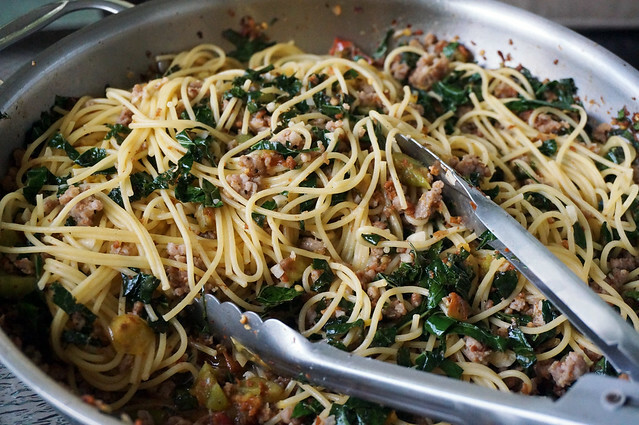 Add the spaghetti to the sausage skillet and cook over medium-high heat, tossing, until through combined. If there is too much liquid, cook until it is absorbed. If the skillet is too dry, add a bit of the reserved pasta water. Serve with black pepper and Parmesan to taste. If you didn’t use up the last of your wine in cooking, a glass of it should go well with the dish! If you don’t have any white wine, or would prefer not to use it, you can deglaze with a little bit of water; just add a few tablespoons and scrape up the browned bits, adding a bit more if you need it. 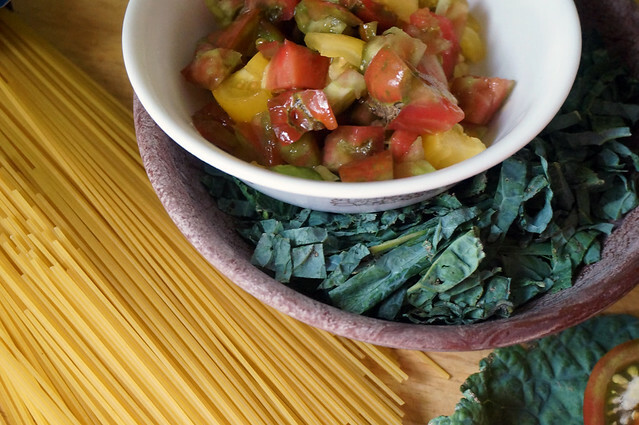 While I obviously have a weird love affair with kale, this would be good with any hearty green, or even spinach or lettuce (though there you’ll probably want to add those light greens at the same time as the pasta so they don’t overcook). Vegetarians, I would do one or two things here. First, obviously omit the sausage; you could sub in a meat substitute or beans, or just let it be fully meatless. Second, I’d take a big onion, any color, dice it, and cook it till deeply browned instead of the sausage. If you and the people you’re cooking for all like cheese, you could add a pretty hefty amount of grated Parmesan directly to the pan, instead of shards on top. Less photo-worthy, but also somewhat easier! Great ideas! I do have some collard greens begging to be used for this …!